For other uses, see Vindaloo (disambiguation). A standard element of Goan cuisine derived from the Portuguese carne de vinha d'alhos (literally "meat in garlic wine marinade"), a vindaloo is a dish of meat (usually pork) marinated in wine and garlic. The basic structure of the Portuguese dish was the Portuguese sailor's "preserved" raw ingredients, packed in wooden barrels of alternate layers of pork and garlic, and soaked in red wine. This was "Indianized" by the local Goan cooks with the substitution of palm vinegar for the red wine, and the addition of dried red chili peppers with additional spices. It evolved into the localized and easy-to-pronounce dish "vindaloo". Nowadays, the British Indian version of vindaloo calls for the meat to be marinated in vinegar, sugar, fresh ginger and spices overnight, then cooked with the addition of more spices. Restaurants in Goa offering traditional Goan cuisine serve vindaloo with pork, which is the original recipe. The dish was popularized by Goan cooks (whom the British favoured, because they had no issues in kitchens and bars when handling beef, goat meat, pork or alcohol) in the British establishments and the ocean-going liners. 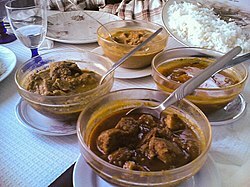 Restaurants outside Goa serve vindaloo with chicken or lamb, which is sometimes mixed with cubed potatoes. Even though the word aloo (आलू) means potato in Hindi, traditional vindaloo does not include potatoes. Vindaloo has gained popularity outside of India, where it is almost universally featured on menus at Indian restaurants. Vindaloo served in restaurants of the United Kingdom differs from the original vindaloo dish; it is simply a spicier version of the standard "medium (spiciness)" restaurant curry with the addition of vinegar, potatoes and chili peppers. The British variation originated from British Bangladeshi restaurants in the 1970s. Vindaloo is one of the spiciest dishes available on menus where it is served, although some restaurants serve a tindaloo, which is a quite different dish that originated in Bangladesh. ^ Taylor, Anna-Louise (11 October 2013). "Curry: Where did it come from?". BBC Food. Archived from the original on 11 December 2014. Retrieved 17 December 2014. ^ a b c "Indal (Vindaloo)". The East Indian Community. Archived from the original on 5 July 2015. Retrieved 13 July 2015. ^ Peters-Jones, Michelle. "Indian Classics – Vindalho de Galinha (Chicken Vindaloo)". The Tiffin Box. Archived from the original on 13 July 2015. Retrieved 13 July 2015. ^ "How to cook a vindaloo – students learn from the best". University of West London. Archived from the original on 9 November 2012. Retrieved 26 October 2012. ^ "Hindi/English/Tamil Glossary". Pravasidesi's Tiffin box. Archived from the original on 17 October 2012. Retrieved 26 October 2012. ^ a b Pat Chapman (2004). The New Curry Bible. London, UK: Metro Publishing Ltd. pp. 118–121. ISBN 978-1-84358-087-4. ^ "lamb phall,vindaloo and madras curry recipes". andyskitchen.co.uk. Archived from the original on 27 October 2017. Retrieved 9 May 2018.